Kids are naturally curious, always wanting to understand more about how their world works. Exploring their questions through science is the perfect solution. When you conduct your own science experiments at home, kids get a hands-on approach to making discoveries. Try making your own elephant's toothpaste, which has detailed instructions and an explanation of the science behind how it works. For more science ideas, check out PBS Kids and search for science activities by age. Even if you already have an art station at home, kids will enjoy exploring online art lessons that provide inspiration and help them learn some new skills. Red Ted Art recommends The Artful Parent, a YouTube channel that focuses on weaving art into your everyday life. Another idea is to find online instruction for an art form your child already enjoys, such as drawing or painting. Learning some new techniques to improve their skills will build self-confidence and may lead to discovering a new passion. 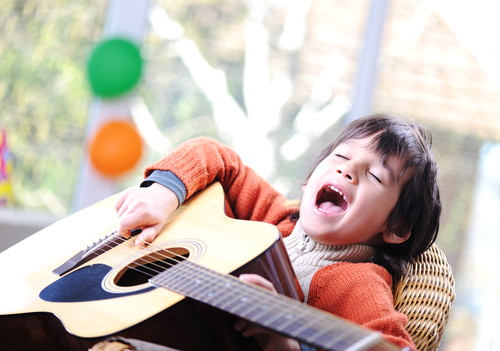 If your child's artistic inclination is more musical than visual (although, of course, they can do both), use your rainy day to make some music. Online music lessons are a great way to learn to play an instrument without the cost of traditional music lessons. You can also explore music activities, such as games for making music, learning music trivia, and even moving to the music. One of the worst things about a rainy day is that kids can't go outside and run. Children need to be physically active to let some energy loose, and not getting enough physical activity can lead to behavior problems. Thankfully, the internet is an amazing source for ideas to get kids moving even when they can't go outside. Check out the best YouTube videos for exercises designed with kids in mind. You can try everything from a silly freeze dance to wacky yoga poses. Or shake things up by having kids compete in Pillow Fight Games. These games are unique ways for your kids to get active inside while also learning game strategy and how to follow instructions. It's an exercise for their body and mind, not to mention it's just plain fun! Visiting a museum always opens children up to a world of new knowledge, but when you're stuck inside and don't want to trek out in the rain, you can get some of the same experiences right from your living room. Start with this roundup of the best interactive museum websites for kids, including The Museum of Modern Art, The Smithsonian, and The Met. Even though it isn't the same as being there, these websites make up for that by putting kids in the driver's seat with innovative ways they can explore and engage with the art. Let kids hone their computer skills and be creative at the same time by helping them set up a kids blog or a family blog. Reading Rockets recommends several free kid's blogging options that allow kids to publish in a private, closed community. This is a fun way they can experience publishing an original story or sharing photos with family and friends without the safety concerns of a public website. The internet can be a scary place, so it's important to check your privacy settings and always monitor your children's online activities. Don't let fear of the bad stuff keep you away from the good, though. With these resources for fun and educational rainy day activities right at your fingertips, kids may be disappointed when the sun comes out! Special thanks to our guest writer, Jenny Wise, for this special summer blog!